I originally created Playground of the Autocrats as a script for an animated short film. But because I think and paint in a lot of detail, I decided to realize Playground first as a series of still, mixed media works. The first step in creating either the still or animated Playground of the Autocrats was to design the main characters. These characters appear throughout the series of triptychs. I turned first to the design of one of Stalin’s godfathers, Peter the Great, of whom there are a number of easily-available portraits. All these suits of armor were useful to me as models for dressing my Peter character. But let’s face it: none of the these portraits are playful enough for Playground. I needed more visual ideas. I soon found them in two sources. One is an actual statue of Peter the Great on the Moscow River (apparently one of the largest sculptures in the world). This statue was great inspiration in part because of its over-the-top design, with curly-cue waves and all those ships’ hulls sticking out of the base. In addition, it has the odd incongruity of scale that’s always great in animation: Peter is huge compared to the size of the ship. That also helped me solve another design issue. Since Playground’s Peter plays the role of a fairy godfather, I needed to invent an imaginative way for him to fly. 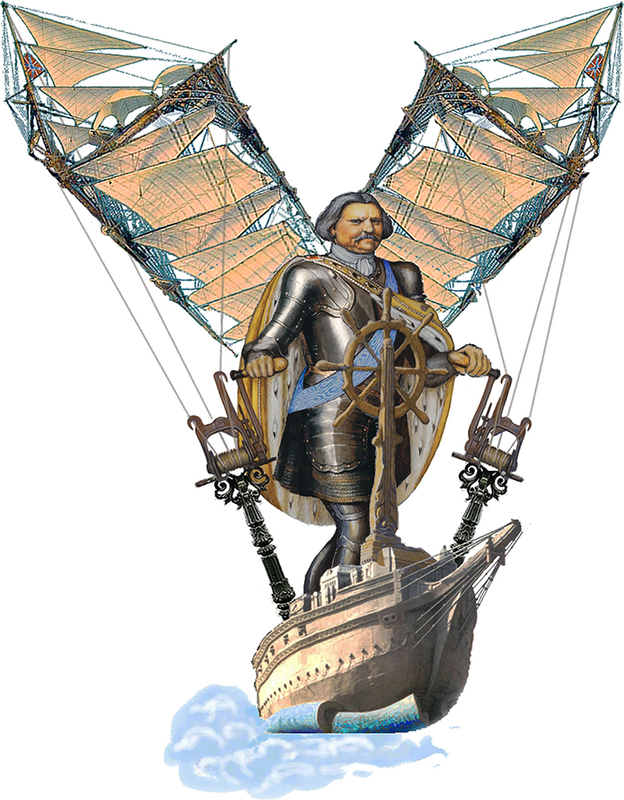 The statue’s ship propped up in the air made me think of a flying ship operated by Peter at its helm. The second seminal source for my Peter design was a very unusual drawing of Peter’s face as an overweight older man. This sly, mature image was much more interesting for an animated character than all the heroic portrayals of Peter in his formal portraits. I used this head as my model, with a body inspired by the formal portraits. Somewhere in this process, I tried an idea that I later discarded. I thought I might have Peter levitate his ship via a propeller on his head. A propeller would fit with Peter’s tremendous interest in the advanced technology of his time, including his lengthy incognito trip around Europe when he worked in ship yards to learn all he could about modern ship building. I spent a bunch of time looking at images of propellers, to figure out which type would be good for Peter’s head: a corkscrew propeller like one DaVinci drew? Which propeller fits the vision? Or if it had prongs, how many should there be? Two? Three? Four? Five? Ultimately I decided a propeller wasn’t going to have enough heft to lift the ship. Or enough gravitas for a Peter the Great, even one playing the part of a flying godfather in an animated satire. I considered giving Peter gigantic wings to lift his ship. But what would his wings be made of? What would make them unique to Peter? Because Peter the Great is so identified with shipbuilding and the military successes of his Navy, I began looking through endless images of 18th century Russian sailing ships. Suddenly it occurred to me that Peter’s wings would be made like a ship’s rigging: of masts, sails, and ropes. After all, sails move ships through the air, as wings propel birds through it. I collaged together a pair of flappers for Peter in a process that took me a good two or three weeks to complete. 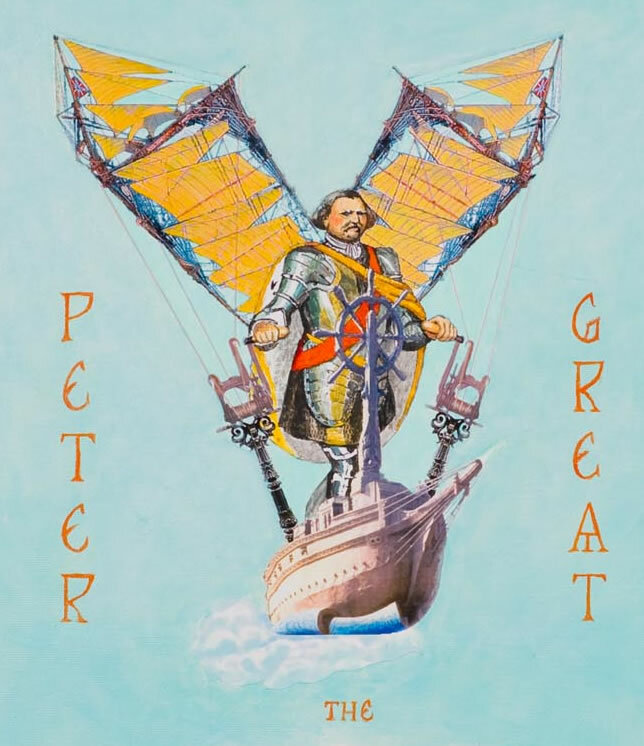 Now I needed a way to allow Peter to control his wings, to turn his sails into the wind at angles that would keep his ship moving through the air. I needed gears, cranks, and other mechanics that would look like they came from Peter’s time. I searched a long time without finding anything to fit the bill. Finally I found it! It’s a fabulous antique coffee grinder on a wrought iron pedestal. With adjustments, this contraption could allow Peter to control the rigging of his wing-sails with his hands. More searching led me at long last to a wonderful antique crank with hooks that Peter’s rigging ropes could pass through. The cylinder turned by the crank shaft could wind up Peter’s rigging just fine! This entry was posted on Tuesday, July 14th, 2009 at 10:04 pm	and is filed under Animation/Character design, Playground of the Autocrats. You can follow any responses to this entry through the RSS 2.0 feed. You can leave a response, or trackback from your own site.